Southern Queensland’s recent wet weather kept bus operations ‘on the hop’ late last week, forcing the suspension of school transport and the slow-down of new depot construction for noted regional operator Kangaroo Bus Lines. "As of early December we were on track for opening our new depot in early March, but the wet weather that has occurred in the past week has pushed that back a few weeks," says Kangaroo Bus Lines General Manager Darren Webster. 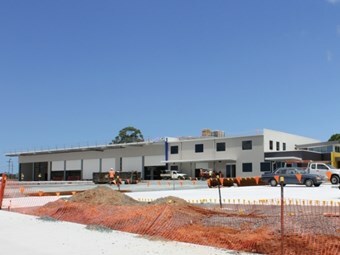 Webster says the original forecast was a 12 month build-time, which would see KBL’s new depot at Burpengary north of Brisbane finished by March, and all seemed on track, with the build team picking up efficiencies along the way. "We did get a bit ahead of schedule, but in a nutshell we are still on target," Webster says. The depot is, however, taking shape with the office and workshop going through its final fit-out. The workshop pit and ancillary equipment is being installed by Brisbane firm Levanta, one of many local Queensland suppliers commissioned by Kangaroo Bus Lines as part of the construction team. "Where possible we have tried to keep the trade suppliers local," Webster says. KBL took title of the 3.03 industrial site at Burpengary, to Brisbane’s north in the Moreton Bay regional shire, last February after a three year approval process. All up, the depot should come online just over four years from inception to delivery, and will relieve pressure on KBL’s existing ‘home’ at suburban Morayfield, five kilometres to the west, and currently squeezed for space to garage the 93 vehicle fleet. "We are looking to relocate staff and vehicles from Morayfield to Burpengary over the Easter holiday period in early April," Webster says. He says KBL plans to take a two-fold approach to the relocation. "We will move administration, operational staff and drivers over one weekend, and then the following week we will move workshop staff, equipment and spare parts." At the time of relocation, the Burpengary workshop will be fitted and ready to go with a new pit, new oil tanks, and associated equipment, such as tyre storage racks. "I think once we move and get settled our staff will be very happy," says Webster. KBL employs a workforce of about 120 people, making it one of the region’s largest private employers. Through the construction phase, Webster and his team have been in regular contact with TransLink which contracts a large part of Kangaroo Bus Lines route service operations. "And the Moreton Bay Regional Council has been very understanding of our situation here at Morayfield," Webster adds. Departure from a much smaller depot facility at Morayfield, adjacent to encroaching residential growth and a widening suburban road interchange, to a larger facility at Burpengary in a dedicated industrial park as anchor tenant reflects KBL’s plans for growth. "The infrastructure we are putting in at Burpengary matches the region’s growth, and will help to improve local bus services," Webster says. "Strategically we will be in a very good spot, with no water flooding issues." KBL’s impending move to a relatively ‘flood free’ location, will be an additional welcome relief from the crowded Morayfield site which was rained in recently, where access was cut to school routes as surrounding flood waters reminiscent of the severe weather events of January 2011 returned to the district. More than 250 millimetres of rain fell in the region on Australia Day and into the Friday forcing KBL to cancel all of its 60 school service runs for the first time in 34 years. KBL’s urban service network of ten routes operated by 20 buses was also closed, but re-opened by midday on the Friday, with school services remaining suspended until schools resumed on Monday, January 30. Webster says most bus routes in the region were impassable. "Many of our drivers couldn’t get to work, and many of our buses couldn’t get out of the depot to commence their runs because a local service road was flooded," he says. "In the interests of everyone’s safety we made the decision to suspend services in cooperation with TransLink." While the Morayfield depot wasn’t itself flooded, the road network was choked – Morayfield and Lindsay Roads were cut, and Deception Bay Road, being the main arterial for route and school services, was also cut.